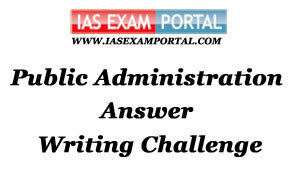 Weekly Mains Exam 2016 Answer Writing Challenge - Public Administration "MODULE- 49" | IAS EXAM PORTAL - India's Largest Community for UPSC Exam Aspirants. Weekly Mains Exam 2016 Answer Writing Challenge - Public Administration "MODULE- 49"
Public Administration- Paper I "Syllabus Topic – Financial Administration: Budgetary Process, Financial Accountability"
Q1. "Good economics and bad politics cannot coexist in a sound budgetary process." Discuss this statement in the context of the developmental challenges in countries experiencing competitive politics." Good economics have to be supported by sound politics so that budgetary process may become manifestation of the combination so as to ensure effective and planned execution. Socialist China is an ideal example of good economics with minimum bad politics. China is it because they do not have competitive politics so they take less populist measures. The bad politics neither considers World Bank directives nor making a globally competitive economy. In India, the principle of financial administration is to comply with the will of the legislature which is constituted with the elected representatives who represent people of the country. The preparation of budget is allocated to each of the respective ministries to do a review of the previous year’s expenditure, current year’s sanction along with the revised estimates for current year and hence arrive at a future figure. The budget reflects the government policies and programmes in order to meet goals of development. The budget is then presented in parliament to be approved by all members. This is followed by discussions and voting on demands, grants, appropriation bill and finance bill. The budget is further executed by the respective ministries. Each ministry have accounting officers that compile accounts of all expenditures that have been undertaken and finally it undergoes an independent audit by the CAG. Bad or inefficient politics always leads to discontent and chaos among general masses and people take no time to building an opinion regarding change in political power. Delhi Assembly elections result in 2015 ,in which a newly rising party capitalized over widespread dissatisfication of because of corrupt and inefficient practice of ruling govt, is the best example . Bad politics is one that can interfere in the process of meeting economic goals. An example is when the UPA Government was trying to pass the Food Security Ordinance it faced severe opposition from the parliamentarians on grounds of increasing the fiscal deficit beyond the benchmark since it would lead to expenditures over and above the budgeted amounts. Another example of bad politics is where the ruling government routes the allocated money to meet their personal aspirations and hence lead to high expenditures, yet not meeting the developmental goals e.g indulgence in Fodder Scam and embezzlement of close to 940 crores. In a competitive political situation like in our country, the opposition party would not leave such an event unnoticed and will ensure that the responsible minister gets due punishment. The objectives of good economics can be sanctified with an equally stable political environment which can ratify the budgetary process and ensure its effective execution. Indian Administration- Paper II "Syllabus Topic –Significant Issues in Indian Administration : Values in public service, Regulatory Commissions"